NEW YORK--(BUSINESS WIRE)--We are proud to announce that RubiconMD President and Co-founder, Carlos Reines, has been selected as a Young Global Leader by the World Economic Forum. Carlos joins a prestigious network of high profile individuals who head governments and Fortune 500 companies, are Nobel Prize and Academy Award winners, serve as UN Goodwill Ambassadors, and are Social Entrepreneurs. Originally from Spain, health technology entrepreneur, Carlos Reines, was recognized for his passion democratizing access to medical expertise at RubiconMD, the leading solution that connects primary care clinicians to specialists for remote electronic consults. Carlos has always been committed to leveraging technology to drive change in healthcare and improve patient lives. “Today, more than three billion people around the world live on less than $2.50 per day and suffer the consequences of having limited access to healthcare. Primary care clinicians using RubiconMD are able to bridge the access gap for their vulnerable patients, improving clinical outcomes and avoiding unnecessary costs,” Reines indicated. RubiconMD has already avoided over a million wait days that would have stood between patients and the care they needed. By joining the Forum of Young Global Leaders (YGLs), Carlos embarks on a five-year leadership journey, bringing together diverse, dynamic and globally representative leaders with the mission to create a community with the vision, courage, and influence to drive positive change in the world. For more information about the YGL program, click here. Carlos is the President and Co-founder of RubiconMD. Originally from Spain, he’s passionate about leveraging technology to drive change in healthcare and improve patient lives. Prior to RubiconMD, Carlos led a division at Telefonica, one of the largest telecom companies in the world. He began his career in digital health at Siemens Medical in Pennsylvania. He obtained his Engineering degree at the Polytechnic University in Madrid, Spain; with specialization in Biomedical Engineering at the Technical University of Delft in the Netherlands. He also holds an MBA from Harvard. 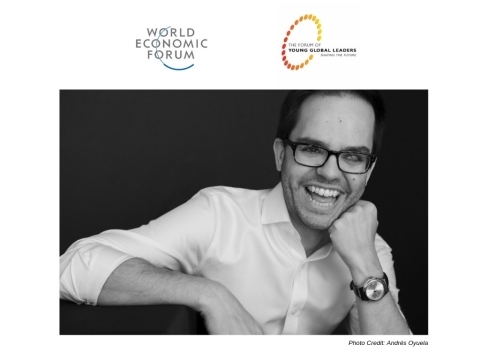 Carlos Reines, RubiconMD President and Co-founder, has been selected as a Young Global Leader by the World Economic Forum.